Brooklyn born, LA based artist Gregory Siff recently added New York restaurant Clinton Hall to the list of venues boasting his large-scale works. Renowned for his colorful pop culture themes and whimsical abstract expressions, the artist has created Clinton Hall-inspired art that adorns the restaurant’s new 4,000-sq. ft. location in Williamsburg. Inspired by the stories and successes of the popular New York beer hall, which has five locations across the city, Siff covered various metal pillars with symbolic markings and that include representations of Clinton Hall menu items, New York City symbols, and faces of the owners’ children. 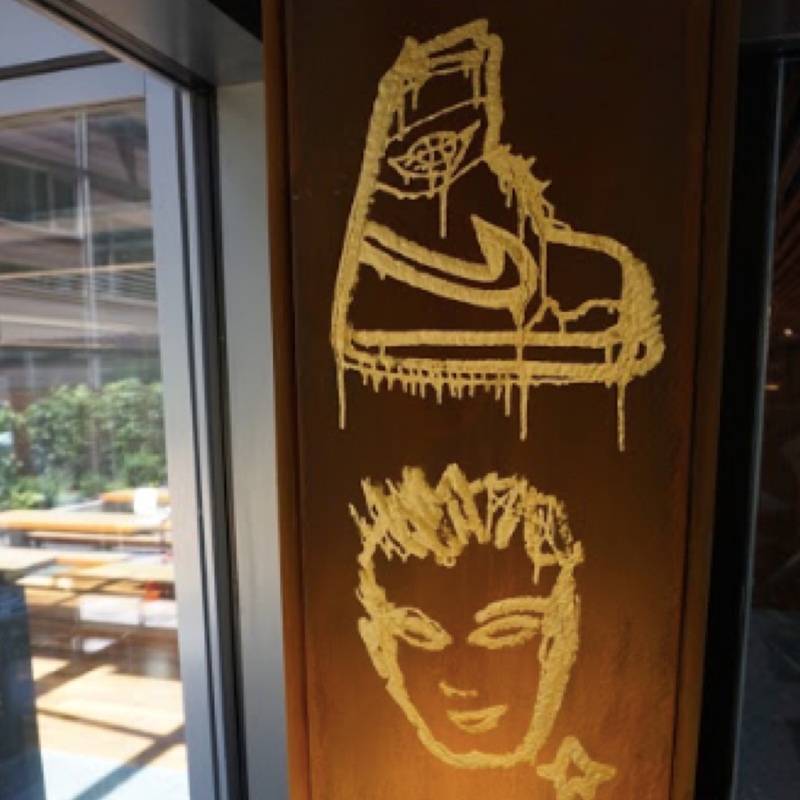 The Clinton Hall team commissioned the internationally recognized artist to create something that encompasses the brand in its entirety, while delivering an edgy yet artistic feel. Siff’s past works include commissions by MoMA PS1, Soho House New York, and Google HQ as well as collaborations with brands like Helmut Lang, Pyer Moss and Saint Laurent. Artist Gregory Siff was born in Brooklyn, New York in 1977. Gregory lives and works in Los Angeles. His artworks are included in Swizz Beatz’s Dean Collection, Deitch Projects, Santa Monica Museum of Art, Moscow Museum of Art, Soho House New York and the Google HQ, to name a few. Siff’s exhibitions include “Happiness Dealer,” Samuel Owen Gallery- Nantucket (2017), “Portrait of an American Ice Cream Man,” 4AM Gallery (2016), Art Miami: Gallery Valentine (2016), “Walls,” Pacific Design Center (2015), Scope: Miami (2012), “Matter of Time,” Gallery Brown (2012), “There & Back,” Siren Studios x The Art Reserve (2012). Siff has touched all areas of the art world with pieces on display in the Museum of Modern Art’s MoMA PS1 for Klaus Biesenbach’s group show “Rockaway!” as well as a mural in the ACE Museum for non-profit The Art of Elysium with Christie’s Auction House. He was selected by Vans Custom Culture to be one of their “Art Ambassadors” inspiring students across the United States to embrace their creativity. His hand-painted Vans were on view at the Whitney Museum of American Art. He has done commissions and installations for Mercedes Benz, Helmut Lang, Marc Jacobs with Louisxxx, Forbes, Rolling Stone, Teen Vogue, The Standard, Sotheby’s, Warner Bros. Records and Pyer Moss. Painting in a purposeful yet playful manner, his work exhibits meaning that is literal yet open for interpretation of nostalgia and childhood. Capturing happy moments while also tackling more serious topics, like the “Black Lives Matter” campaign, Gregory Siff does not shy away from using his art to initiate a conversation. He creates his iconic “storyboards” with each image representing an emotional or creative state of mind the artist considers to be a meaningful fragment of his life. His work has been seen in The New York Times, Andy Warhol’s Interview, Treats!, The Wall Street Journal and W Magazine. Most recently Gregory collaborated with luxury fashion house Saint Laurent, bringing his imagery to the new Winter YSL 2017 Women’s and Men’s Ready to Wear Line. This entry was posted in Uncategorized and tagged 360 Magazine, art, artist, artistic, artwork, Born, Brooklyn, Claire Swartzlander, Clinton Hall, edgy, Gregory Siff, la, location, New York, popular, restaurant, stories, Vaughn Lowery on July 5, 2018 by wp360mag.